"Amazon China" listed in FMC's registry of intermediaries, forwarder executive says. E-tailer Amazon.com Inc.'s Chinese operations have been granted authority by the Federal Maritime Commission (FMC) to operate as an ocean freight forwarder, according to a published report. According to Ryan Petersen, CEO of Flexport Inc., a San Francisco-based freight forwarder and customs broker, "Amazon China" is now listed in the FMC's directory of "Ocean Transport Intermediaries." According to a blog post by Peterson yesterday, the official name on the FMC registry is "Beijing Century JOYO Courier Service Co. Ltd.," with the trade name "Amazon China" listed on its license. Peterson posted that a 2006 Securities and Exchange Commission filing showed that JOYO to be a "significant subsidiary" of Amazon.com Inc., and that it's currently doing business as Amazon China, Peterson wrote. The global ocean freight market is estimated to be around $100 billion a year. It has been plagued by severe overcapacity for several years as vessel supply has far exceeded demand. U.K. consultancy Drewry Maritime Consultants Ltd. said on Monday that global containership growth surpassed world port activity for the fourth consecutive year, and that global box capacity is approaching a record 20 million twenty-foot equivalent units, or TEUs. Global container rates plumbed record lows in 2015 and show no near-term signs of rebounding. The extreme imbalance in the global market has driven down ocean freight rates by about 30 percent year-over-year, according to investment firm Robert W. Baird and Co. Inc.
Theoretically, this could spell opportunity for a high-volume company like Seattle-based Amazon, which attempts to leverage its massive volumes to capture low prices from its shipping partners. Amazon has also expressed a desire to develop its own transportation and logistics portfolio to support the movements of its own orders and those of merchants that use Amazon for fulfillment services. In recent weeks, reports have circulated that Amazon is building an air delivery network, under the project code name "Aerosmith." It has been reported that Amazon leased 20 cargo aircraft during the recently concluded peak delivery cycle, and is testing out an underutilized air cargo complex in Wilmington, Ohio, that had been the domestic U.S. hub of DHL Express, which abandoned the facility soon after ceasing domestic air and surface operations in January 2009. It has also been reported that Amazon has purchased the French parcel provider Colis Privé to expand its business-to-consumer delivery capabilities in Europe. The notoriously secretive Amazon never comments on such reports. However, one analyst, who asked not to be identified, said the company uses individuals and outlets as "proxies" to disseminate information about its strategy and execution. In March 2014, DC Velocity reported that Amazon was planning to build a transportation network to lessen its reliance on long-time providers like Memphis-based FedEx Corp. and Atlanta-based UPS Inc. At the time, it was reported that Amazon would use a mix of a large private fleet, regional parcel carriers, and the U.S. Postal Service. In October, DC Velocity reported that Amazon was assembling a group of high-level executive team to lead its push to develop a transportation network, plans for which would be announced later this year. The Wall Street Journal reported in late December that Amazon hired more than 40 UPS supervisors, managers, and executives during the last three years; perhaps its most significant hire was Kniffen Kelly, a 16-year veteran working on engineering UPS' transportation networks, to become Amazon's director of sort-center engineering. Amazon continues to be a sizable customer of UPS. However, it is believed to have reduced its exposure with FedEx, while increasing its involvement with USPS. For example, consultancy SJ Consulting Group Inc. said this week that about 70 percent of Amazon's holiday traffic was delivered using the Post Office's "Parcel Select" service, where packages are inducted by large-volume users deep into the postal pipeline for last-mile deliveries to residencies. A wave of mergers and acquisitions is reshaping the third-party logistics market worldwide. A longtime industry observer explains what's going on. This story first appeared in the Quarter 3/2015 edition of CSCMP's Supply Chain Quarterly, a journal of thought leadership for the supply chain management profession and a sister publication to AGiLE Business Media's DC Velocity. Readers can obtain a subscription by joining the Council of Supply Chain Management Professionals (whose membership dues include the Quarterly's subscription fee). Subscriptions are also available to nonmembers for $34.95 (digital) or $89 a year (print). For more information, visit www.SupplyChainQuarterly.com. Mergers and acquisitions (M/As) have played a major role in building the current structure of the global third-party logistics (3PL) industry. Over the past three decades, 3PLs have used them for such purposes as achieving scale, broadening service offerings, expanding geographic coverage, obtaining assets and/or technology, securing management talent, acquiring new customers, increasing market share, supporting earnings growth, gaining knowledge in a targeted industry (health care, for example), and in some instances, reducing competition. The M/As have not only been used strategically by individual 3PLs to strengthen their market positions, but also were used by private equity companies to build large-scale service providers. One example of such private equity investments was Apollo Capital's use of acquisitions to build Ceva Logistics. We began following the merger and acquisition activity of large 3PLs in our annual surveys of 3PL chief executive officers (CEOs) in 1994. Each year since, we have asked the CEOs in all three of our annual regional surveys (North America, Europe, and Asia) to comment on such issues as the number of acquisitions made by their companies during the preceding year, the nature of those acquisitions, the impact of acquisitions, the significance of acquisitions made by private equity companies, and company projections of revenue growth to be generated through acquisitions in subsequent years. In other sections of the surveys, we have asked them to identify the most important 3PL industry dynamics and to tell us what they believed would be the most significant developments in the 3PL industry the following year. Interestingly, even though the number of large-scale 3PL mergers and acquisitions slowed dramatically in the aftermath of the global recession, in each subsequent annual iteration of our surveys the CEOs still identified M/As as a major industry dynamic, and they continued to expect a related industry restructuring to begin the next year. Despite the CEOs' predictions, relatively few large-scale acquisitions occurred in the industry between 2008 and 2014. We found that puzzling, and in our 2014 surveys, we asked the CEOs why merger and acquisition activity continued to lag expectations. Several themes emerged in their answers. First, the CEOs generally saw companies they might have targeted for acquisition as being overpriced. Second, and more importantly, as a group the CEOs remained collectively rather cautious because of the post-acquisition integration problems they and other 3PLs had previously experienced. Third, several CEOs noted that their companies had already achieved the desired scale through previous acquisitions and organic growth, and that further acquisitions were deemed unnecessary unless they were either likely to produce an immediate market niche in an attractive area such as health care, or to expand their company's geographic footprint. Only three of the 27 CEOs who participated in our 2014 surveys reported that their companies had made any significant acquisitions in the previous year, and they said they expected acquisitions to play a relatively modest role in company revenue growth over the following three years. Their average estimates were as follows: North America, 5 percent; Asia-Pacific region, 7 percent; and Europe, 12 percent. It should be noted that 13 of those 27 executives didn't expect any of their companies' growth in the next three years to come from acquisitions. Beginning in early 2014, however, the pendulum began to swing in the opposite direction. As shown in Exhibit 1, since then there has been a new wave of large-scale mergers and acquisitions in the 3PL industry. In January 2014, XPO Logistics announced its acquisition of Pacer International. This was the first of several recent acquisitions by XPO Logistics. At the time, Pacer was an asset-light intermodal service company that was the leading provider of cross-border U.S-Mexico intermodal services. In April 2014, FedEx reported its intention to acquire Genco, a large 3PL with a strong presence in reverse logistics that had positioned itself as the leading provider of "product lifecycle logistics." The acquisition, completed in January 2015, was seen by many as a means by which FedEx could strengthen its competitive position in the e-commerce space, particularly with respect to handling returns for e-commerce companies. The wave of acquisitions continued in February 2015 when Kintetsu World Express, a large Japanese freight forwarding company, announced it was buying APL Logistics, a subsidiary of Neptune Orient Lines Ltd. (NOL) for $1.2 billion. APL Logistics, which generated most of its revenues in the Americas, had been established in 1980 as a logistics subsidiary of a U.S.-based ocean carrier, American President Lines (APL). It was subsequently sold to NOL in 1997 for $285 million. In March 2015, Penske Logistics acquired Transfreight, a company with extensive experience in providing logistics services to clients in the automotive industry. That acquisition strengthened Penske's position in servicing the rebounding U.S. automotive market. XPO Logistics made another move in April 2015, announcing that it was acquiring Norbert Dentressangle, which had bought Jacobson just one year earlier. The acquisition will give XPO a substantially larger footprint in Europe. UPS joined the acquisition movement in July 2015 with an announcement that it was acquiring Coyote Logistics, a non-asset-based truckload carrier that was also quite active in the freight brokerage business. The buying frenzy continued in August 2015 with Geodis SA, a 3PL owned by the French national railroad, SNCF, announcing that it was acquiring U.S.-based OHL from a private equity company. Once again, a European-based 3PL was establishing a more prominent position in the U.S. 3PL marketplace. XPO Logistics made its third large acquisition since early 2014 in September 2015, with its surprise announcement that it had entered into an agreement to acquire Con-way Inc. for an estimated $3 billion. The acquisition includes Con-way Freight, Menlo Logistics, Con-way Truckload, and Con-way Multimodal. And in October 2015, the Danish logistics giant DSV, which has grown through the acquisition of some 30 companies over the past 10 years, said it would buy U.S.-based UTi for $1.35 billion. This move reflects the 3PL's stated desire to gain a larger presence in North America, South America, and Asia. Between early 2014 and September 2015 these companies spent nearly $20 billion on acquisitions. Given that several of those acquisitions had occurred between the time our 2014 surveys were completed and the time our 2015 surveys were to be conducted, we decided to ask the CEOs participating in the 2015 surveys what, in their opinion, had triggered that wave of acquisitions. Their responses were quite interesting and tended to cluster in four categories: customer pressures in the marketplace, the desire for geographical expansion, financial considerations, and economic conditions. Several CEOs indicated that their companies were feeling market pressures from key customers to expand their range of service offerings. As the scale of 3PL customer buys has become larger and more geographically dispersed, many customers have been forced to use multiple 3PLs to meet their service requirements. Managing multiple relationships with service providers is complicated and time-consuming, and many of those customers are not enthralled with the 4PL (fourth-party logistics) model of doing business, in which a primary or lead logistics service provider oversees and coordinates the work of other 3PLs. Some companies that have used 4PLs have reported that rather than reducing the level of complexity of their relationships with 3PLs, it has simply added another layer of complexity and one more party to deal with. As a result, 3PLs are under pressure to provide key customers with a broader range of services—to be a "one-stop shop" that offers every service those customers may need. Acquisitions provide the means to rapidly expand the service menu and respond to these pressures, particularly if the acquired company has a history of providing high-quality services in the categories desired by customers. As global economic conditions have improved during the past several years, the financial performance of many 3PLs has also improved. Several respondents noted that some 3PLs have a lot of cash. Others observed that because of low interest rates, the cost of money is low. Under those circumstances acquisitions became far more attractive. Another factor is that several of the recent 3PL mergers and acquisitions have involved sales by private equity companies that had previously acquired 3PLs. That should not be surprising, as this is exactly what private equity companies have done in many industries: acquire a company, reorganize it, strengthen it financially, then sell it off when the time is right. The time appears to be right. Finally, most of the 3PL CEOs were convinced that regional economic conditions were improving, and their companies therefore needed to respond to the possibility of significant market growth in the next several years by expanding their scale, service portfolio, and geographic coverage. Not surprisingly, most of the CEOs involved in our 2015 surveys said they believe industry consolidation is likely to continue in the near future. But, as has often been observed, in this realm the easy part of the process is acquiring a company, and the difficult part is the post-acquisition integration of two companies. Substantial research has shown that less than half of all mergers and acquisitions generate the benefits that were expected by management. Why is that the case? If the responses we have received to that question in our annual surveys over the past 21 years are any indication, the following post-acquisition challenges commonly experienced by 3PLs are often to blame. Leadership changes. Large-scale M/A transactions frequently are accompanied by top-level management reorganizations, and executives who have guided the acquired company may leave the combined enterprise. That is disconcerting to other executives who might have been recruited by those individuals. They may consider leaving as well. If the exodus of management talent is too extensive, there is a real risk that the loss of intellectual capital will hinder the future operations of the company. It is incumbent upon the acquiring company to make identifying, reassuring, and retaining key individuals an early and very important priority. Employee morale. An acquisition may create redundancy of employees at many levels of an organization. It takes considerable time and skill to "rightsize" the employment base of these companies while doing as little harm as possible to employee morale. Outplacement services and separation packages can provide some relief, but the fear of being "downsized" often leads employees who have the greatest mobility to leave the acquired company as the integration of the two enterprises proceeds. Given the chronic shortage of management talent in the 3PL industry, this issue also demands considerable attention from upper-level management post-acquisition. Systems integration. Many 3PLs have invested enormous amounts of money in developing systems to not only assist them in their operations, but also to differentiate themselves in the eyes of existing and potential customers. Because of limited capital availability and the size and geographical spread of many large 3PLs, it is not uncommon for different business units of the same company to have different information systems that are not linked. Many of the acquisition targets of those companies are in the same situation. Consequently, the acquiring company often faces a daunting challenge in attempting to integrate not only its own systems but also those of the acquired company. This is costly and time consuming, and it is not uncommon for the two companies to continue to operate their systems separately for a significant period of time due to the potential disruptions and enormous costs caused by those integration efforts. This is a less-than-optimal situation and often leads not only to a significant lag in the realization of costs savings, but also to interface problems with 3PL vendors, alliance partners, and customers. It should also be noted that the accounting systems used by the two enterprises are often not compatible, the importance accorded to specific performance metrics by the companies may vary dramatically, and data that is considered critical by one of the companies has not historically been collected by the other. The cost of eliminating these data-related problems is often much higher than anticipated. Realization of multimodal synergies. Several of the recent mergers and acquisitions have brought additional modes of transportation under the control of the acquiring 3PLs for the first time. It is quite challenging to realize the potential synergies among those modes and harness them in a way that delivers a more attractive value proposition in the marketplace. The characteristics of the various transportation modes and their operations vary dramatically, and recognizing those differences and combining them in ways that not only benefit customers but also the combined companies will pose a significant challenge. Cultural integration. Executives who have been involved in M/A activities often stress the importance of a good cultural fit between the two companies. The workplace environment, workload expectations, reward systems, communications networks and styles, and many other factors will affect the success of any integration effort. This is even more complex when the transactions are multinational in nature. The formality of the interaction between managers and subordinates, adherence to chain-of-command protocols, and language problems are but a few of the issues that arise in such situations. Failure to identify and consider major differences between the cultures of the two companies pre-acquisition, and to plan accordingly, can lead to costly conflicts in attempting to reconcile these differences after the acquisition. Brand identity. In an industry that lives in constant fear of commoditization, most large 3PLs devote considerable thought and resources to establishing a corporate brand identity that differentiates the company from its competitors. In building their brands, 3PLs may emphasize numerous factors, including such things as their technology, expertise in a particular geography, past history in serving particular industries, collaborative approach to working with clients, or history of innovation. If their branding efforts have succeeded, existing and potential customers recognize the company based upon those features. In many instances, the company that is acquired has a very different brand identity. This can lead to market confusion about the brand of the new, combined enterprise, which can be very disconcerting for customers who are considering renewing 3PL contracts or signing one for the first time. It's important for the key customers of both companies to be reassured that the new enterprise will use the strengths of both to provide an even better service experience for their customers at competitive prices. In many instances, the acquiring company rebrands the acquisition to reduce this confusion. While some companies take several years to do this, others do it immediately. XPO Logistics, for example, stated in its initial press release announcing its agreement to acquire Con-way that all of Con-way's business units would be rebranded as XPO Logistics. In addition to addressing branding issues, it is also very important for the new enterprise to reconcile significant differences in the sales and marketing strategies of the two companies. In many instances, those companies have had common customers, and they must address such important issues as who "owns" the customer post-acquisition. At the same time, it is to be expected that shared customers will now want to "bundle" the services they have historically purchased from the two companies and will negotiate aggressively for lower rates on the now-collective buy. Relations with existing customers. For many 3PL customers, acquisitions may cause considerable anxiety. Their concerns range from uncertainties about the quality of the services they will receive from the merged enterprise to the relative importance that enterprise will accord to them in the future. The integration process itself can be very unsettling for customers and may lead them to reconsider their future use of the larger enterprise. Once again, it is extremely important for those driving the integration process to communicate to their company's key customers the message that the existing provider/customer relationship is valued and that the combined enterprise is committed to continuing to provide high-quality services to those customers. Integration timetable. A common post-acquisition problem in many industries is that top management often sets unrealistic timetables for the integration of the two enterprises. Top management typically is under pressure from board members, stockholders, and the financial community to produce early proof that the acquisition was justified. But, by establishing a schedule for integration that is too aggressive, those executives place unrealistic expectations on employees who are responsible for producing those results. This may lead to premature decisions that not only lessen the likelihood of achieving long-term success, but also create a pressure-filled environment in which employee morale spirals downward and key people leave the organization. A more realistic timetable that acknowledges the need to understand the strengths and weaknesses of both companies is far more likely to produce the long-term benefits envisioned by those who supported the acquisition. 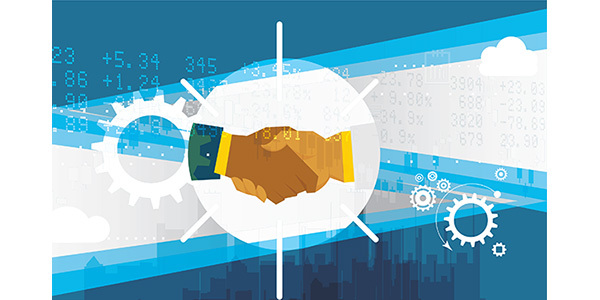 What does this recent wave of acquisitions mean to the 3PL marketplace? For one thing, it may trigger more acquisitions that are defensive in nature. Thirteen of the 30 CEOs involved in our 2015 surveys believe that will be the case. At the same time, six of them said they believe their companies may be acquisition targets. For another, from a structural perspective, the big are getting bigger, and they often are moving into service sectors and/or geographies in which the acquiring companies may or may not have had previous experience. Blending all aspects of these larger organizations will be a major challenge, but if done carefully, service offerings will become more robust, and internal economics may reduce costs and improve efficiencies. It should be remembered, though, that larger companies are not as agile as smaller ones. In economic downturns they usually have more difficulty in rightsizing their operations than do smaller companies in this industry. That is particularly true with respect to companies that had been asset-light prior to their acquisitions of asset-based companies. From a customer perspective, the M/A trend will delight some and worry others. A big question on many minds is this: How big do you have to be to retain the interest of the larger, combined 3PLs? Our earlier research clearly indicated that large 3PLs are increasingly selective in terms of the customers and industries they focus upon. Does the size threshold increase as the scale of the 3PL increases? If so, some niche 3PLs may actually gain business that is no longer valued by these larger logistics service providers. The ongoing consolidation of the industry also increases the likelihood that large, often global, customers will be able to reduce the number of 3PLs they use. As a result, their relationship management activities might be simplified, and their consolidated buys might produce cost savings as well. After several years of limited merger and acquisition activity, the third-party logistics industry is now involved in a wave of transactions that are fundamentally changing the structure of the industry. For 3PLs, their alliance partners, and their customers, my advice is, hang on—the ride isn't over yet!